Toro Wine bar is at the back of the old Cape Quarter, outside on Waterkant Street. It’s a small place, but quite easy to spot due to the large glass frontage which allows one to see inside. What you’ll see, if you do happen to look inside, is an appealing looking restaurant. But it’s not a restaurant, it’s a wine bar and aperitivo lounge. It’s not just a fancy name, the difference goes deeper than that. Toro is about the wines. The idea is to provide an ever changing selection of high quality wines that are not well known. I can vouch for this as we drank Ladera when we were there. Ladera is a boutique winery and the wines are difficult to get hold of. The wine is excellent and amazing value for money. Grant and Matteo (the owners) are very proud of their wine selection, and rightly so. It’s a refreshing change when many places are ‘selling’ their wine list to the highest bidder. It’s also an aperitivo lounge because they serve some food. It’s a focused menu, with an Italian influence. We started with a selection of antipasti. The meats and cheeses are all R15 each, so 3 different meats and 3 different cheeses would set you back R90. It comes with bread so that would make a good snack/starter for two people. I was impressed with the quality of the meats. There are also panini and bruschetta at around R40. We had the artichoke & truffle oil bruschetta which was very tasty. The breads are from Jason’s Bakery. I haven’t tried any of the desserts, but I see they have churros on the menu, so I must go back and try that. Grant and Matteo seem to be there a lot of the time and the place is very small so you can call someone over easily if you need service. In terms of decor, it’s a pretty funky place. The side walls house the wine collection on well lit (maybe a bit too well lit) glass shelves. Olive green walls, terracotta tiles, and some interesting and fun art pieces. There is also a selection of carafes (at very good prices, incidentally) and other wine paraphernalia on sale. There are about 6 tables and two big leather couches. I’d recommend playing it safe and booking as most of the tables were reserved when we went. It’s a good spot for an intimate dinner or a small function, maybe birthday drinks or something. There is a small outside veranda for smokers as well. They have free wifi for those who might want to check emails while grabbing some lunch. 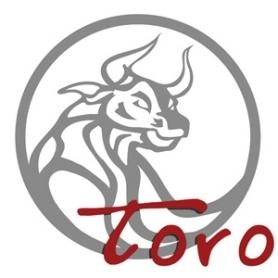 Toro is a nice addition to the Greenpoint offering, certainly somewhere I would take people for a drink and a bite. My dining partner that evening has also written a review and included pics of the food on her blog My Love Affair with Cape Town.